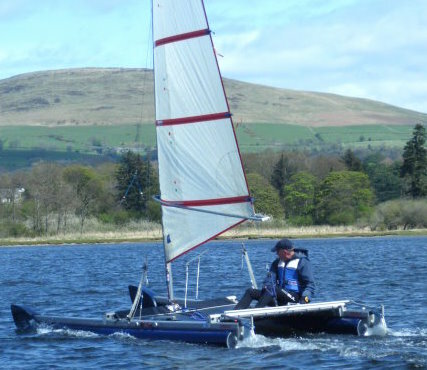 This introduces you to Catapult, the ideal boat for exciting racing, fast cruising and easy fun use. 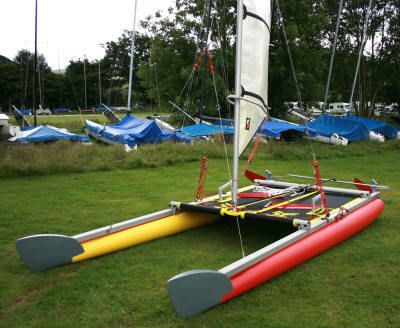 The design is unique:- a strong, stiff aluminium frame supports slender inflatable hulls. 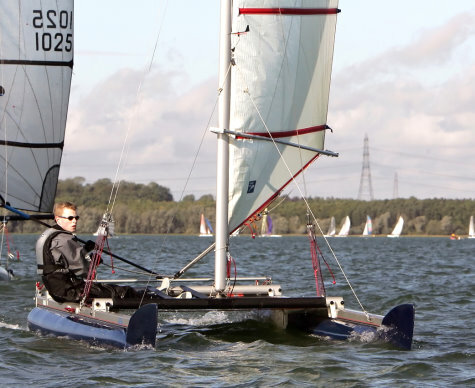 The resulting light weight, only 95 kgs (210 lbs) makes Catapult sensationally fast for a 5m (16ft 4in) boat. The light weight allows this performance with only a 10 sqm. sail area, so that it remains forgiving and well behaved. A new owner can get into racing comfortably, with support from the other members. 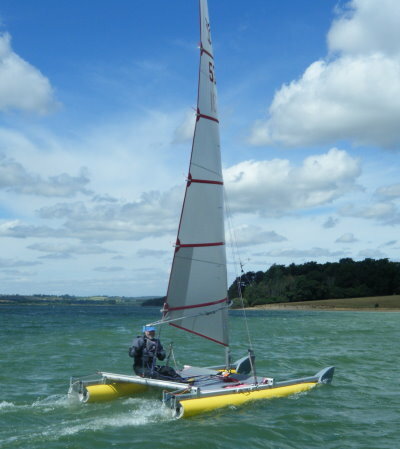 The boat can be sailed with crew or family on holiday for fun and learning, but remains a true single-hander (not needing a crew to assemble it or manage it on land or water) It is the perfect fun boat still with full racing potential. 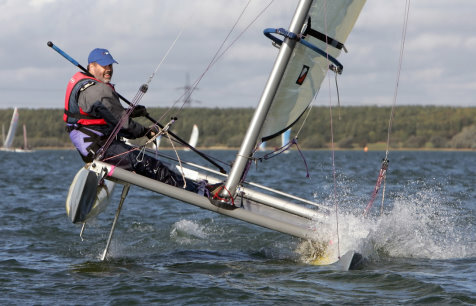 Catapult sailors have taken up the boat because it is so flexible for the individual owner, who can be supported by a strong Association from the outset, and immediately or later take up the vigorous Association racing programme. The inflatable Hypalon hulls are extremely resistant to damage, and the boat can rest on them at the water's edge to be slid in. Since the basic aluminium frame and spars were well engineered from the outset, most parts are almost indestructible, but any repairs are a matter of some metalwork. Any component can be separately replaced and the Association is on the lookout for sources of spares. The boat pictured immediately below (left) is the very smart new boat built for the 25th Anniversary Regatta in 2007. On the Catapult below right, all components are 30 years old, including the inflatable hulls (except the new rig, and a tiller extension) and it looks good, and races competitively.